Adventures in the Endless Pursuit of Entertainment: Quick, send me $50,000,000! In today's NYPost, Michael Riedel says that Jujamcyn Theatres may be up for sale. That includes the St. James Theatre, the Al Hirschfeld Theatre, the August Wilson Theatre, the Eugene O'Neill Theatre, and the Walter Kerr Theatre. The last Hoovers report estimated 2007 sales around $24.1 million. Oh the shows I'll make sure are produced! I'll keep Jersey Boys at the August Wilson - I haven't seen it, but it sounds like a cash cow. The shows I don't like can always go to the Hirschfeld because few shows do very well there anyway. Arty stuff can stay at the Kerr and the O'Neill. The piste de resistance will be at the St. James: a repertory theatre! Which composer? Sondheim, of course (no Frogs! No Roadshow!). And the Actors Fund Performances will be Jerry Herman shows (only Mame, Hello, Dolly and La Cage Aux Follies). First in, frequent Sondheim collaborator James Lapine can get us going with his revue iSondheim. Okay, send $$$! Hey, I can't even count that high. But I would like to be in show business! I'll break open my piggy bank. Sorry, Esther, but I'm taking $$$ only. OMG! If I had money, I would totally go in on that with you. 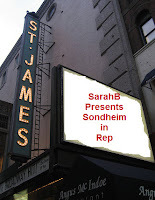 I love the idea of a Sondheim Rep theatre. Why the hell not? While your idea sounds like a good one (I would not know since I have never been anywhere near New York to begin with), I think it lacks some of the other favorite composers. Where would you put Rodgers & Hammerstein, or does that have a place? What about geeting your own shows produced, for if you are the owner of these grand theatres, you should be able to put your creation into your 'experimental' venue, right? About that fifty million dollar price tag, well, I think you should apply to the government for the money. They are always free with their figures, so they would probably give you more than you need and tell you to keep the extra!